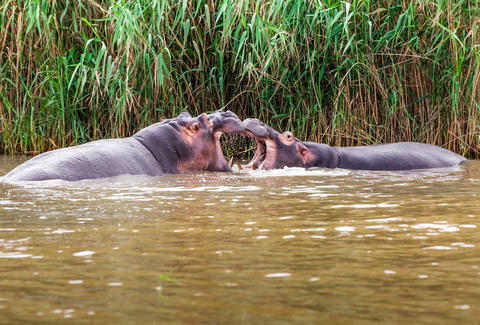 As an informed citizen, you're well aware that Fiona the Hippo is the most beloved hippopotamus alive, possibly of all time. Though technically the daughter of two large semiaquatic mammals named Henry and Bibi, the one-year-old resident of the Cincinnati Zoo truly feels like our nation's child. But they grow up so fast. Young Fiona has her first suitor. And since she's a member of Generation Z, the courtship is naturally taking place over Twitter. That 1,200-pound love interest's name is Timothy. He's a two-year-old hippo from the San Antonio Zoo, and what he may lack in years he more than makes up for in confidence, as you can see in this tweet. A less bold hippopotamus might have stuck to DMs, but not Timothy. He tagged her in a tweet and put his hippo heart on the line. The Cincinnati Zoo then responded for Fiona. Apparently Cincinnati zookeepers are less comfortable with speaking in the voice of one of the most dangerous animals in world. Or maybe Fiona's just shy. You be the judge. Whatever your take on this, we can all agree that "Your DNA will decide if you’re the one for our little diva" is a profoundly upsetting sentence. Timothy then solicited Twitter's advice for how to proceed. Twitter was more than happy to provide advice, both positive and negative. OMG! Fiona from @CincinnatiZoo wrote me back! What do I say now? I am FREAKING OUT! We'll have to wait and see if this is true love or just a youthful crush, but it's certainly what the world needed after the season finale of The Bachelor. James Chrisman is a News Writer at Thrillist who thinks Timothy focused a little too much on Fiona's looks and not what a beautiful hippo she is deep down. Send news tips to news@thrillist.com and follow him on Twitter @james_chrisman2.